Public meeting at CICCIC. Tuesday 22nd Nov 7.30pm for 8pm start. Booking advised but not essential. 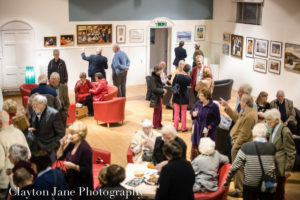 Want to support the arts in Taunton? 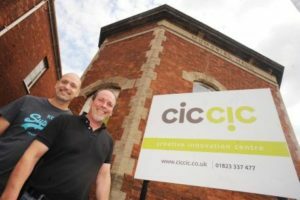 Believe that you can help support CICCIC’s growth and Taunton’s future? 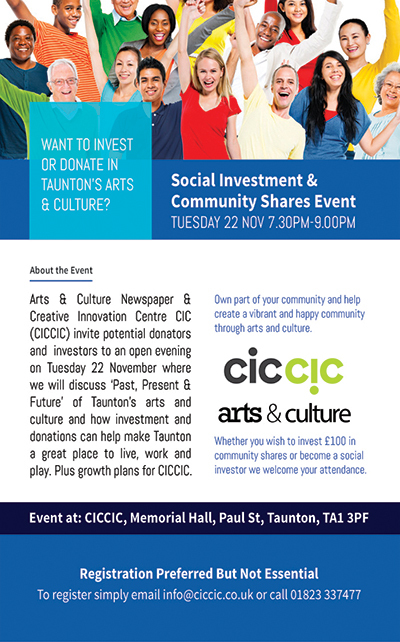 If so we cordially invite you to a public meeting to show the past, present and future of CICCIC and how your investment or support can help us growth and make Taunton a thriving culture or all things creative. 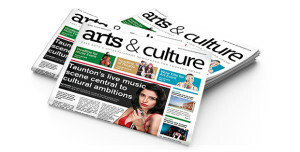 Did you know that local newspaper ‘Arts & Culture’ is the brain child of, and produced by, Creative Innovation Centre CIC also known as CICCIC in Taunton? Did you know that the CIC means a registered ‘Community Interest Company’? This means we are a limited company with a social purpose. Any profits we do make goes back into the community and all assets we own cannot be sold, and god forbid if we were to fold, we would have to donate our assets to another local charity. Moreover, we do not have the red tape of a charity, yet do many charitable things as part of our social purpose that could match any charity with similar endeavours. Did you also know that CICCIC is one of the most proactive arts and cultural organisations, with community at its heart? Who over the past 2 years have worked with over 40 community groups, schools, colleges, charities, businesses and government organisations? If so, then you’ll also know that we are not publicly funded and are always looking for investment so we can continue our work and drive quality of life for all in Taunton and county. In fact, we make no profit from this newspaper, but we know it’s really important to share with the community what is going on and how they can feel connected to their community via participation. Of course it could be profitible with investment. We also drive a very diverse yet quality programme of cultural events, but sometimes we don’t make much profit on these too either; as diverse culture is always a risky business but essential to the fabric of our communities. We believe that culture should be accessible to all and price has a bearing on accessibility. Of course, like many organisations in arts and culture we could select things that do make profit such as tribute bands or nights that encourage lots of drinking of alcohol. 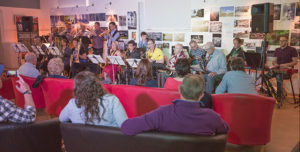 But we believe that supporting original arts and music works, new musicians, writers, poets, artists and anything in between, we provide a true support network and in return it creates a place where local people can grow as individuals and community. Are you the same as us? Are you more committed in doing good than earning a quick buck? Are you a ‘Social Investor’ as it’s called these days? Do you believe that the arts and cultural offerings in the community are essential to community well-being? If so we need your help and in this time of austerity its needed even more. But here we don’t take the micky. We just need to raise enough to keep us afloat and assist our team to deliver even more amazing services for the community and develop it’s growth programme. To this end we are considering a type of community shares scheme where you; the community; own this newspaper and even be able to have community shares in CICCIC itself, supporting all that is good about arts and culture in Taunton. Plus, prices can start from just £10 so everyone can have a piece of Taunton, but in our hearts we are hoping that some individual will be able to provide a substantial commitment for greater impact. Before we commit resources to this, which costs money, we ask anyone interested in helping to either attend our ‘CICCIC Past, Present & Future’ open evening, which is free for serious community investors, on Tues 22 Nov. If you are a social investor or take shares in a community share scheme then you can get 30% income tax relief known as Social Investment Tax Refief (SITR).